The evidence points to a quickly thrown-together affair that people close to the planning said would probably draw about 20,000 people—substantially smaller than last year’s Easter Egg Roll, which drew 37,000—and be staffed by 200 volunteers, one-fifth of the usual number. These people spoke on the condition of anonymity because they were not authorized to describe the plans for the Easter Egg Roll, which are still evolving just a week before the event. 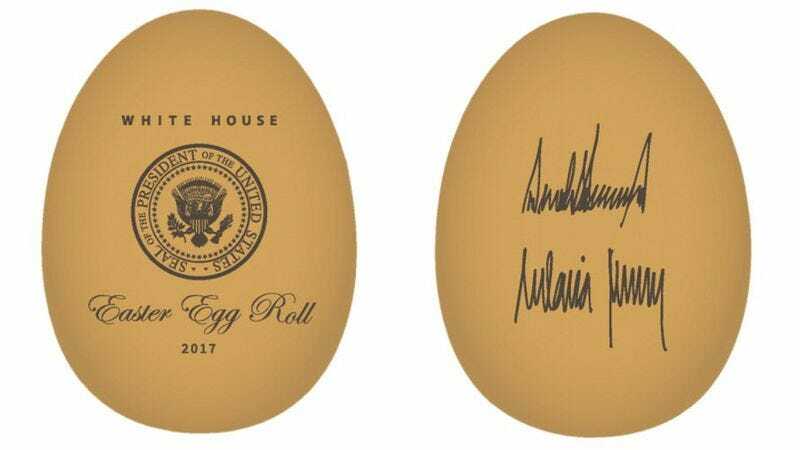 The White House has ordered 40,000 of the commemorative eggs—about half of the roughly 85,000 ordered in 2016—with 18,000 to be given away at the Easter Egg Roll and another 22,000 available for sale, according to Lara Kline, the vice president for marketing and communications at the White House Historical Association, the official retailer. So far, it’s not looking good. But at least they have a vet on staff: Maybe press secretary Sean Spicer can actually be useful for once, as all of his vast experience as the White House Easter Bunny will finally come into play. Naturally, the official statement from the White House is that “Plans for the Easter Egg Roll are well underway, and the White House looks forward to hosting it.” This is according to Stephanie Grisham, the first lady’s communications director, who has been on the job for less than a month.